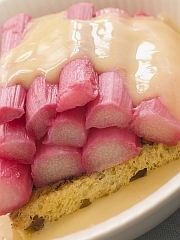 Rhubarb and Custard is not just a famous 70s TV show, but a most wonderful pudding, too. It must be one of the simplest puddings around - a reminder that good things really don't need embellishment.Come February, I usually need something to cheer me up, to make me forget the cold and damp and dark that comes with an English winter. And nothing does it as well as the first few stems of rhubarb, tart and refreshing and delicately pink. It's so beautiful compared to all the grey outside! Young and delicate as it is, it needs gentle treatment. Later, as rhubarb appears in my garden and is more plentiful in the shops, I turn it into rhubarb crumble, rhubarb fool and really delectable rhubarb cake, but the first few stems need nothing more (or better!) than lashings of thick, golden custard to turn them into a heavenly pudding. Buy as much pink rhubarb as you can afford ... at this time of year it can be rather expensive, but you don't want to be stingy with your pudding. You want at least 2-3 stems per person. You may also need a little sugar. And then you'll want a jug of hot, thick vanilla custard. Home-made is best, but if you're short of time, most supermarkets stock ready-made custard and some of it can be rather good. Or pay a visit to your local Deli, where they often specialise in tasty time-savers. To get your pudding started wash and peel your rhubarb and cut it into 2in / 5cm length. Place in a saucepan, sprinkle with a little sugar and add a couple of tablespoons of water. Just enough to cover the bottom of the pan. Cover with a lid and place over a low heat. Poach the rhubarb gently until soft. You don't want it to fall apart, so keep an eye on it. I find that it helps if you don't stir the rhubarb but just shake the pan a little from time to time. 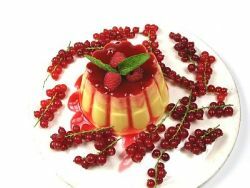 Lift the rhubarb pieces with a slotted spoon into pudding bowls and top with hot custard. And that's all there is to it: Rhubarb and Custard, ready to be devoured! Need More Fast Pudding Ideas? Then let me introduce you to Mr Nigel Slater. Here's a man who truly loves food. But - like most of us - he has a busy schedule and never enough time to spend in the kitchen. 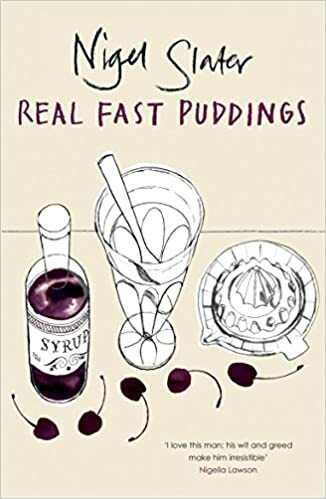 His selection of Real Fast Puddings should be on the bookshelf of every cook that loves to finish a meal with something sweet. 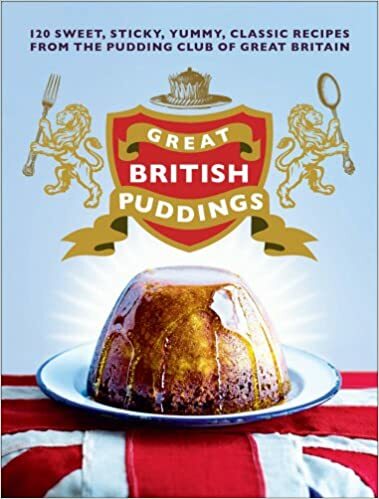 I've read mine to ragged shreds - not always when I was looking for a pudding, because as well as being a useful sort of book, I like the way Nigel Slater writes about food. His love for it really shines through! 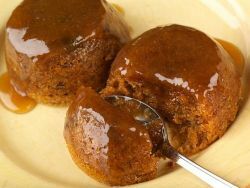 For more pudding ideas return from Rhubarb and Custard to the recipes page.